For some bizarre reason convention projects seem to moving right along. I approach my stitching time a little differently than many. I do machine work during the day and handwork at night in front of the television. Many stitchers tell me that they do handwork during the day. Oh well, this works for me. I have all but the buttonholes done on this gown from my Jeannie Baumeister class at convention. It is her pattern Antique T-Gown Dress and Christening gown. So I am reduced to handwork on both this gown and the pink linen matinee jacket. I hate this stage of a project. I can't wait to get finished so I can wash the blue marks out. The wash away blue marker just makes it look messier than it is. But of course any project comes alive after it has been washed and the miracles that an iron and a can of starch can achieve are monumental. So check back soon, I hope to have this one ready for its recipient, a hanger, soon. 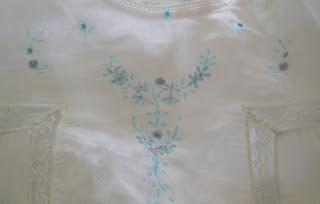 Martha, when you are embroidering this type of design how do you handle moving from one flower to another? I usually try to weave the thread around in the threads on the backside and if the next flower is close enough that the "trail" isn't obvious on the front I just trail it. If not, I'll weave it around and tie it off. I'm sure that's not the correct way, so tell me what you do, please. On the lazy daisy flowers I go back to the center after each petal and if I am able to angle the "trail" to the next flower behind where a petal will be I trail to the next. If not I tie it off. Behind the bullion flowers I tie off each one. I don't think there is "one way" to do it, I think the best way is the one that gives you the result you are after. Good for you! I am just now unpacking mine. Buffy's DH came over to get her machines so I had to finish getting everything out... DD just frowned at fabric and patterns. :-( Well, I think it is time to go find another victim. This is going to be stunning. Dang, its stunning with blue marker! I subscribe to the same M.O., handwork at night, machine work by day. I sew less fingers thru the machine that way! Martha, I love the Jeannie T-gown, and that Wendy Schoen bunny sure has a wonderfully-puffy tail! I, too, do my machine work during the day, and hand work in the evening in front of the TV, keeping DH company. Of course, my output is nothing like yours, but "when" I do it matches! Thanks everyone for the wonderful comments. 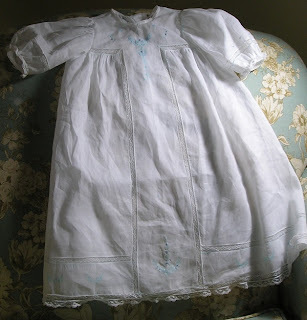 I love heirloom sewing and smocking.